Now that I've mastered the art of liquid liner application (just about) I'm curious to try some different shades. I do like black but it can sometimes be a little dark for my pale complexion and ideally I'd love to find some reasonably priced purple and green shades. 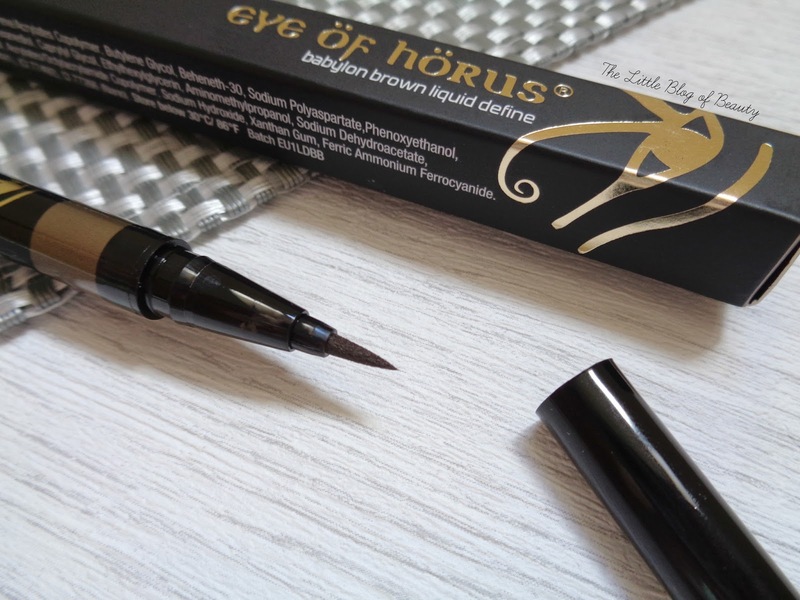 When I was picking the products I wanted to go in my first Love me Beauty box I spotted that they had an Eye öf Hörus Liquid Define eye liner in a shade called Babylon brown. A Google and Pinterest search didn't really help me out with what the shade actually looked like, but I decided to just give it a try. Eye öf Hörus are an Australian brand that offer eye and brow products. Their formulas are based on those of the Ancient Egyptians and included sacred ingredients including organic moringa oil. They're still quite a new brand within the UK but you can get hold of their products from Beauty Bay and Cocktail Cosmetics and they've won a few awards in the UK including Best make-up brand in the 2015 Latest in Beauty awards. 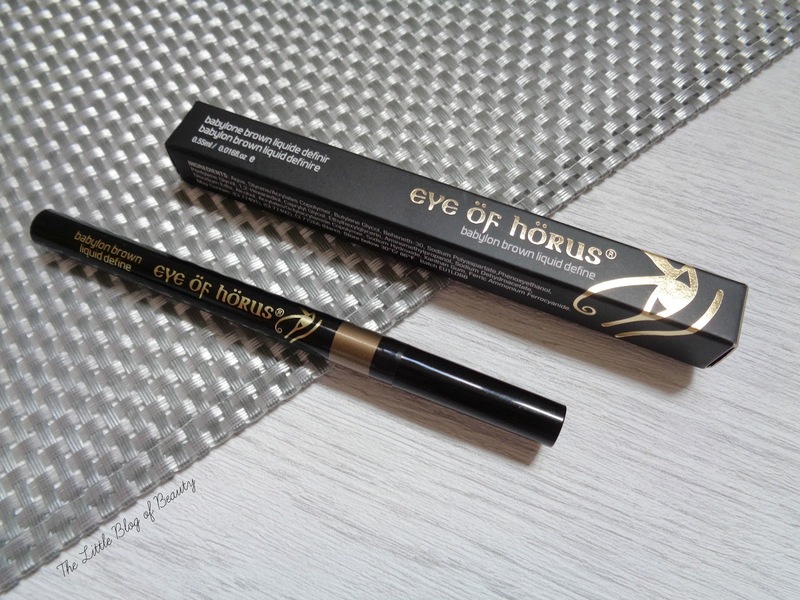 Eye öf Hörus' packaging is black and gold and reminds me of the likes of MAC and Illamasqua. The liner comes in a sturdy cardboard tube that features the same black and gold design. The Liquid Define eye liner is felt tip pen style liner, which is my favourite type of liquid liner as I find it the easiest to apply. It has a reasonably short nib, which I also prefer over a longer nib. When you replace the lid on this it has what I would describe as a cushion-close feel to it, you know like you can get on drawers so if you push them too hard they close slowly rather than slamming? At first I wasn't sure about it as it felt like it would squish the nib, but it's obviously there for a reason, I'm just not entirely sure what this is. The lid does replace with an audible 'click' so you know you've put it back on properly and it shouldn't dry out. I thought the gold/bronze band going around the packaging on the pen might be an indication of the colour of the liquid but this wasn't the case. I don't know why I thought this might be quite a light brown shade but it's actually really quite dark and when I presented my eyes to my mum and asked what colour my liner was she said black. 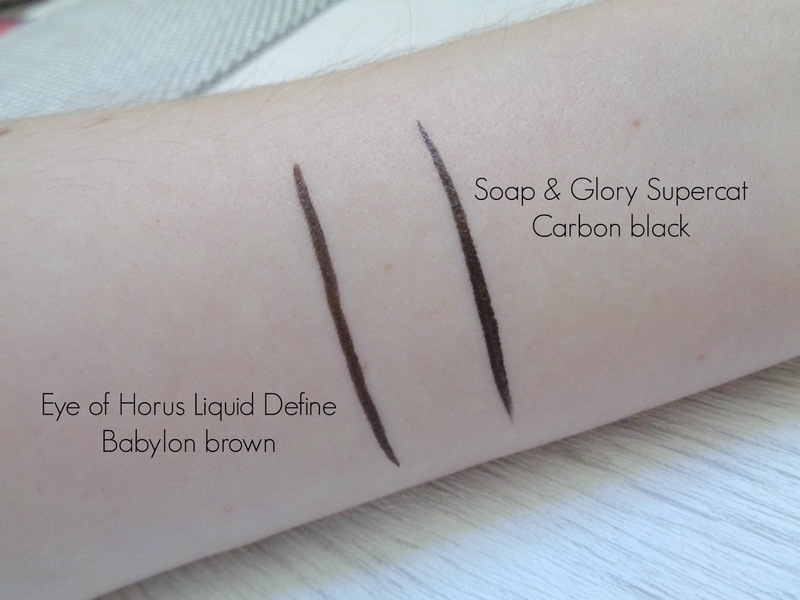 I've compared it to Soap & Glory's Supercat liner in the swatch above and although you can just see a difference it's very slight. Although I did find this quite easy to apply it's a very fluid liner. By that I mean the link transfers very easily to your skin, so if you accidentally make contact with your skin in the wrong place you could end up in a bit of a mess. I would imagine that over time this might start to dry up a little but this might not happen until it's starting to run out. Because of how easily the ink transfer I would say this isn't one for a beginner or somebody who isn't very confident at using liquid liner. I've had one mess up (that wasn't too bad to remove working quickly) but I have managed to apply this presentably a few times, it just takes me a little longer than usual. I found that through the day this doesn't fade, and I do have slightly oily lids, and it also doesn't smudge. The smudge test (giving my eye a good rub) and asking my boyfriend (and checking in the mirror just to be sure) revealed that it didn't budge at all. When it came to removing it there was some rubbing involved but it does come away reasonably easily with an oil cleanser. I am slightly disappointed that this is very close to black but it is a very good liner, although as I said I wouldn't recommend it to anybody who is new to liquid liner or not very confident. The Eye öf Hörus Liquid Define liner is available on Beauty Bay for £15 but only the black shade appears to be available. What is your favourite liquid liner? I've heard many wonderful things about this eye liner, I'm curious to check it out. I love this brand, this is so pretty! Liquid eyeliner is still something I struggle with, so perhaps this isn't the product for me. It would end up all over my face!